Prior to storing drums, inside a 55 gallon drum storage building, inspect them for rust, dents or any sign of obstruction. Ensure the lids or bungs are in proper working order. Any sign of obstruction to the container could lead to a leak or hazardous situation. Before handling or transporting chemical drums, read the labels to understand the containers’ hazard classifications. If labels are missing or disintegrated, immediately report to officials, and do not handle drums that have unknown contents. 55 gallon drum storage building by US Chemical Storage increases safety and security to personnel and the environment. Before moving containers, inspect the drums’ lid for any sign of stress or pressure. If a drum’s lid is bulging outwards, this may indicate that contents inside are having a chemical reaction. When moving chemicals into a 55 gallon drum storage building avoid moving them by hand. Moving drums by hand can cause the materials inside to shift, which can result in a spill or leak, or even cause physical injury. Use mechanical equipment including a forklift or drum dolly to safely transport drums. All persons handling or storing chemical drums should wear personal protective equipment. A 55 gallon drum storage building is designed with an EPA approved spill containment sump to contain any leaks or spills that may occur during storage. If a 55 gallon drum is leaking or damaged, it can be overpacked in a larger 85 gallon drum to prevent continuous leaking. Committing to full compliance, persons who handle, dispense, or store hazardous materials must be trained in the hazards of the chemicals being used and the necessary cleanup methods required by the owner’s emergency plan. According to NFPA 1 (60.5.1.3.7.1), “Persons in areas where hazardous materials are stored, dispensed, handled, or used shall be trained in the hazards of the materials employed and actions required by the emergency plan…”. Are you prepared for storing chemical drums? Remain compliant with a 55 gallon drum storage building by US Chemical Storage. 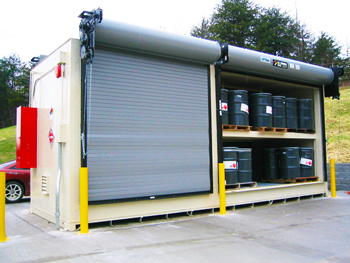 Contact us online or call 888-294-2729 to learn more about compliant drum storage buildings.